Use balls to learn about different kinds of motion and energy transfer. 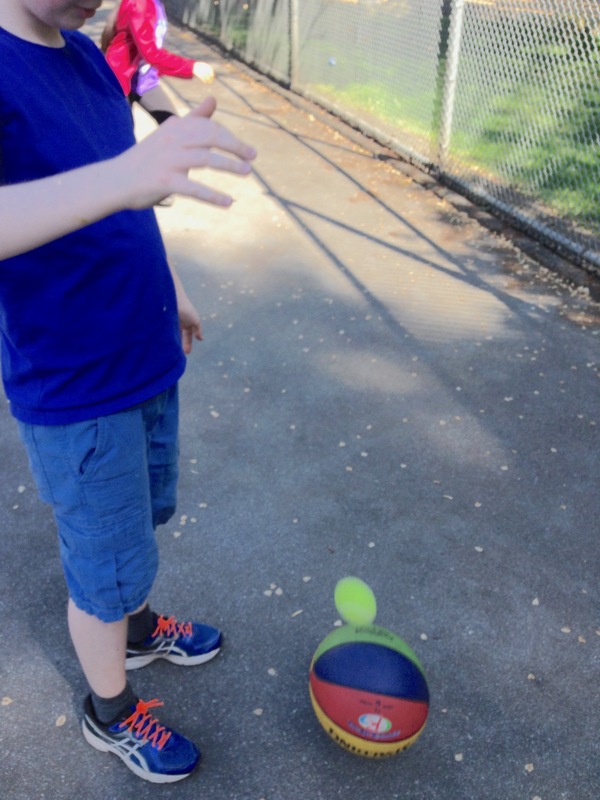 Use the balls to learn about different kinds of motion. The students are instructed to move the balls in various ways, to make them move through various motions: spin, roll, slide, lift, fall, bounce, swing. Discuss where the force comes from (the "push or pull") that made the ball do each motion. The students' hands will provide the force to make the balls spin, roll or slide. 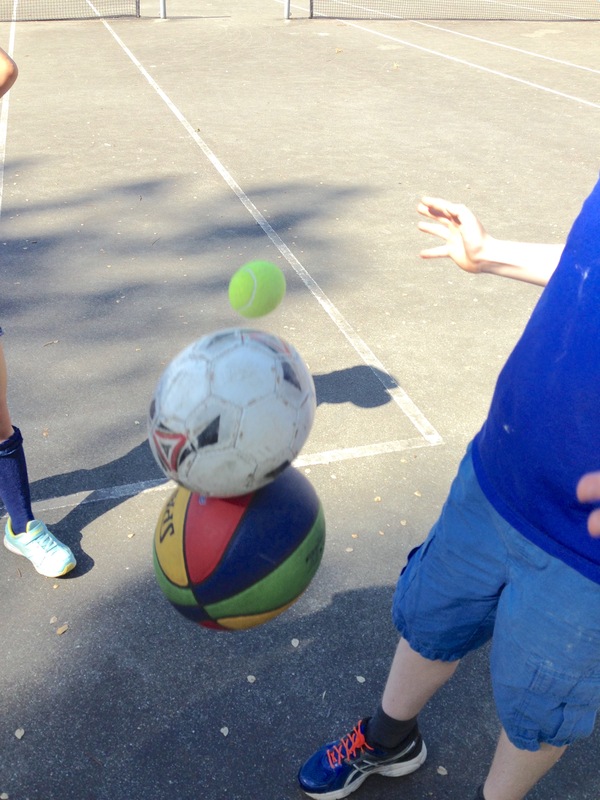 The force of gravity will pull the ball down to make it fall or bounce. When the ball bounces, the floor pushes up on the ball to make it go up again. For the swing, the push and pull of an arm makes it move, and gravity is pulling down on the arm - you can feel it. Bounce a basketball or a tennis ball. They both start with gravitational potential energy ("height energy") when they are held up high. This gravitational potential energy changes into motion energy as the ball falls. As the ball hits the ground the motion energy becomes elastic potential energy, as the energy is stored in the flexible material of the ball. This elastic energy is converted back to motion energy as the ball moves upwards again, which is converted back to all gravitational potential energy as the ball reaches the top of its bounce. The ball does not bounce as high each time, as energy is lost as heat as it rubs agains the air, and as the material of the ball flexes on the ground. Now stack the tennis ball on top of the basketball and release them both at the same time. The tennis ball will fly really high (or sideways) as it bounces off the basketball. 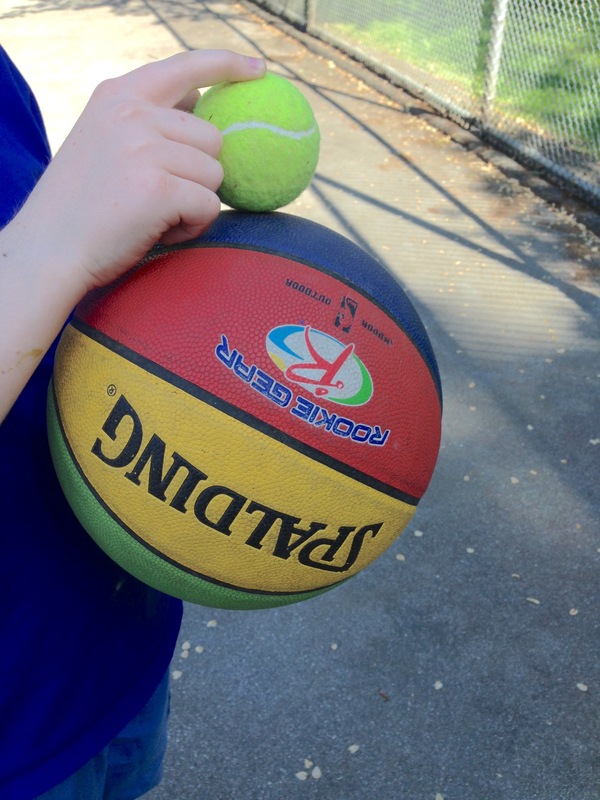 The basketball gives its energy to the tennis ball and so does not bounce up much at all. The basketball is larger, so has more momentum (speed and mass combined) than the tennis ball as they fall. When the basketball bounces up it transfers its momentum to the tennis ball. As the total momentum is the same when it is transferred between the balls, but the tennis ball is a lot smaller than the basketball, the tennis ball will move a lot faster. So the tennis ball bounces back up with its own momentum plus the momentum of the basketball, which makes it move really fast. The basketball loses its momentum, so hardly moves upwards at all. Students can experiment with more than two balls, balls of different sizes etc. They will run around a lot.